Faba beans, formerly known as broad beans, are among the oldest crops in the world. It has in fact been claimed with some justification that the Pyramids were built on faba beans! They are today a major crop in many countries such as China, Egypt and the Sudan; and are widely grown for human food throughout the Me~iterranean region, in Ethiopia and in parts of Latin America. In recent years there … has been a growing interest in faba bean production as a protein source for stock feed in parts of Europe, North America and Aus* tralia. 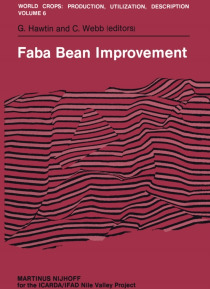 The publication served by this preface arose from the first International Faba Bean Con- ference, held in Cairo, Egypt, on March 7-11, 1981 which provided a suitable forum for the review of many scientifically important aspects of the improvement of the crop. Leading faba bean specialists from four continents who participated were able not only to contri* bute from their personal expertise in relevant subjects, but in return to gain from their ex- perience of Nile Valley conditions and from close contact with so many of the world's faba bean scientists. The conference was supported in the main by the ICARDAjIFAD Nile Valley Faba Bean Project. Additional support was received from a number of other organisations and institutions whose help is gladly acknowledged. These included the Agricultural Research Council (ARC) of the Egyptian Ministry of Agriculture; G.T.Z. of Germany; IDRC of Canada; the National Research Center of Egypt; and Cairo University.